PROMISE: As governor, Gina will: Improve our state’s tourism infrastructure, with new signage on highways, new visitors centers and efforts designed to move tourists to various attractions throughout the state. Campaign website: jobs and the economy - Website now deactivated. 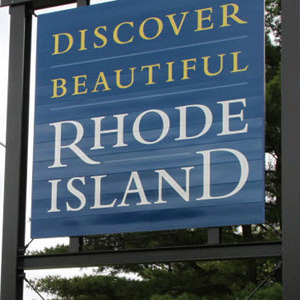 By Mark Reynolds on Sunday, August 16th, 2015 at 12:00 a.m.
On the campaign trail in 2014, Gina Raimondo promised to improve the state's "tourism infrastructure" by posting new signs on highways and by investing in new visitor centers as well as helping tourists move around the state. So how is the governor doing with these promises? In June, Raimondo's sixth month in office, the Rhode Island Department of Transportation applied for a $9 million federal grant to build a "travel plaza" and "transit hub" at Exit 1 on Route 95. The plaza would bring "robust transit service" to southern areas of the state while offering tourists a convenient location to access tourism information and other amenities, according to Rose Jones, a DOT spokeswoman. The grant application calls for a 6,000-square-foot building, parking for up to 200 vehicles, parking for bicycles, tourist information, food concessions, and auto fueling and electric vehicle charging stations. Rhode Island expects to learn in September whether it will receive the money. The money would pay for just one facility, not the centers that were promised. Also, the state's chief civil engineer wrote in June that the project will stall without the grant. Moving on to the other parts of Raimondo's promise, let's examine the candidate's pledge to develop infrastructure to help tourists move throughout the state. The DOT is "exploring" expanded rail service and rapid transit buses for "key corridors" such as the 6-10 connector. The agency is also looking at the development of "multi-modal transportation centers throughout the state," Jones said. The expansion of these transportation resources is regarded as a way of serving a growing number of tourists who are traveling the country without their cars. That one is on hold, Jones said. First, the administration intends to develop a comprehensive tourism brand and marketing campaign with $4 million appropriated last session by the General Assembly. Once the state campaign is set, the new signs will follow, Jones said. Bids are in and the Rhode Island Commerce Corporation hopes to award a contract next month, according to Raimondo spokeswoman Marie Aberger. Candidate Raimondo made three promises to improve what she called "tourism infrastructure." Almost nine months later: there's a pending grant request for a travel plaza at the state's front door; the DOT is looking at new ways to help tourists get around Rhode Island without cars; and the state's $4 million tourism marketing effort will pave the way for new highway signs. That's a start. We rate Raimondo's tourism promise In the Works. GinaRaimondo.com, "Gina Raimondo Continues Focus on Jobs," April 2, 2014, accessed Aug. 6.